We offer our commercial clients a gutter cleaning service that is efficient, safe and cost effective for gutter cleaning and repair service in London & surrounding areas. Commercial gutter cleaning services, gutter repair and replacement services for your shop, businesses, offices, industrial unit, hotel, schools, hospital, residential & much more. 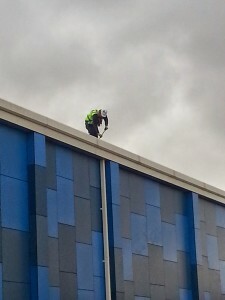 All our commercial gutter cleaning services in london specialists are fully experienced with high ladder, safety harness, scaffolding or cherry picker work are health & safety trained at heights. Thames Gutter London deal with gutter cleaning, repairs and replacements in Central and Greater London. As a modest size company we consider our customer service to recognise all of your individual needs and has, so far, built a strong reputation amongst our previous clients and we hope to grow on this further. You can count on us that any work we carry out will be done to the highest quality, with high standards of safety and service as well as being competitively priced with superior quality. We pride ourselves in continually being competitive in our prices and there are no nasty extra costs. We can provide you a quote on your commercial property in an email, if you fill in a form on our contact us page or by Phone. 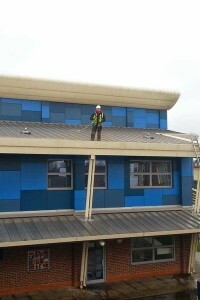 Specialises in both commercial and residential gutter cleaning, replacements and repairs. Thames Gutter London – Commercial Gutter Cleaning services In London – Gutter Repairs Services – Gutter Replacement services – in London & all surrounding areas. Yes Thames Gutter London have a very large database of residential & commercial customers that are happy to supply you with written testimonials or you can see written reviews on Google maps. If you would like further information on our residential & commercial guttering services, please do not hesitate to contact a member of our helpful team. Thames Gutter London are 99% sure that your guttering will last once it’s repaired by one of our technicians. This is why we offer our customers a Free 12 month-5 years guarantee. * We want to ensure that you are happy with the guttering we replace or repair, hence why if your guttering was to leak within 12 months from its original repair we would come back at a convenient time to you to fix the leak free of charge. Our guarantee is simple, customers having their guttering replaced can inspect the finished results, to reassure you in our ability to offer complete satisfaction and to alleviate any doubt we give every customer, residential or commercial a FREE 5 year guarantee. * In the event that your gutters leak or has a problem within 5 years following a gutter replaced by us, we will call back and fix the leak or problem no quibble free of charge.